United States reacted to the threat of North Korea's attack rhetoric. The U.S. military put the missile protection system on Guam. Kaesong industrial park is still closed. Ministry of Defense of the United States announced it will put a missile deterrent system in the coming weeks on the island of Guam. Previously, America has sent warships and bombers to the conflict. South Korea's Yonhap news agency and the Japanese newspaper "Asahi Shimbun" preach, North Korea placing intermediate-range rockets in the east coast. North Korea previously announced, the atomic attack to the United States "has been approved". North Korea continued war rhetoric against the United States and South Korea. In a statement distributed mentioned official KCNA news agency, the General Council to allow the deployment of "modern weapons" and warned that a war may break at any time. According to the KCNA, Washington had officially informed, that the move is in response to the threat from the United States. According to experts, the North Korean rocket does not have adequate technologies to attack the American mainland. But the medium-range rockets could have attacked the headquarters of U.S. forces in South Korea or in Japan. North Korea called the Hawaii and Guam as a target rocket attacks. Guam is located about 3000 kilometers from North Korea. In response to this new threat, the United States would put the missile system "Terminal High Altitude Area Defense" (THAAD) on Guam. Mid-March, the Minister of Defense Chuck Hagel has announced that it will deploy 14 new missile protection system to the west coast to strengthen the defense. 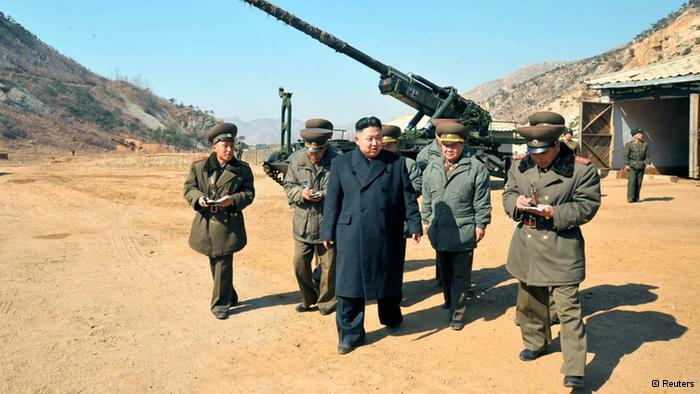 Chuck Hagel now say, the United States still seeks to avoid armed conflict with North Korea. The situation on the border of South Korea and North Korea still tense. The regime in Pyongyang, Kaesong industrial park is still closed. Yonhap news agency had reported that South Korean workers in Kaesong are still being told to leave North Korea until the 10th April. But South Korea's defense ministry denied any such ultimatum. According to South Korea's Defense Ministry, North Korean officials only asked a few companies to submit a list of workers who want to leave North Korea to 10 April. Until Thursday (04/04) there are still more than 800 South Korean workers at Kaesong. North Korea on Wednesday (03/04) close the Kaesong industrial park and stated, all South Korean workers who are still there will be allowed to return to South Korea. North Korea also threatened to withdraw the 53,000 North Korean workers from the region. Kaesong industrial park is located about 10 kilometers from the border to South Korea. The area was opened in 2004 as a project of economic cooperation. The project is a symbol of approach between the two countries. Kaesong is also an important source of foreign exchange for the North Korean regime.